Please donate to our appeal, and support vulnerable refugees. There is a great need, people are living in inhumane conditions. 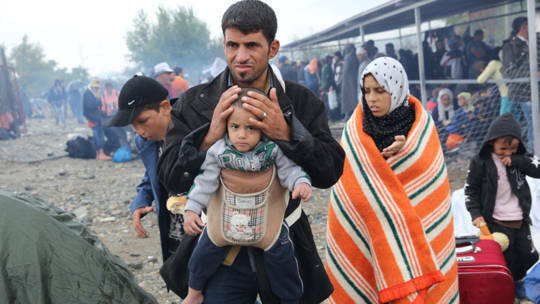 Your donation will help our sister agencies in the Caritas network across Europe, the Middle East and Syria to support traumatised refugees. “They pay $1200 to the traffickers and arrive on plastic dinghies from Turkey. The kind of thing you might buy for your holiday, they are really unsafe. There is a great need, people are living in inhumane conditions, sleeping outside without clean water and adequate food. We work in many of the countries where migrants and refugees originate from, including Syria, as well as neighbouring countries that host refugees. 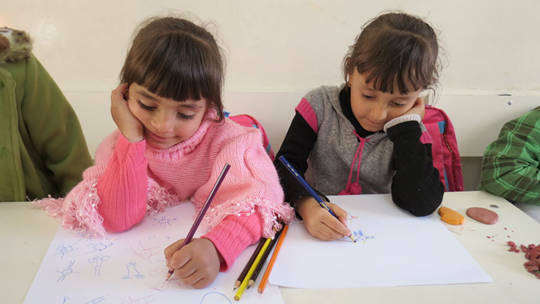 Syrian refugee children taking part in drawing activities at a child-friendly space. Our partners in Lebanon, for example, work closely with children who have been affected by this crisis, and use counselling, drawing and play to help them come to terms with what they have experienced. This vital work means that these children can begin to feel hopeful about their future. The war in Syria has caused a humanitarian crisis on a staggering scale, and it’s getting worse every day. Over 250,000 people have been killed and more than 6.6 million children, women and men driven from their homes.